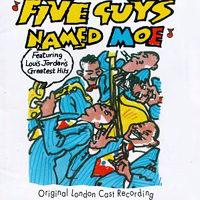 Original Broadway Cast, 1992 (Columbia/Sony) (2 / 5) It must have seemed that Five Guys Named Moe had “Broadway cash cow” written all over it: a transfer of a small-cast West End hit in an era when the most popular shows on the Great White Way were British imports. 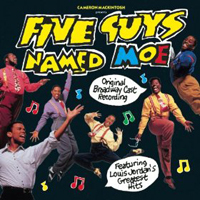 But this celebration of a distinctly American musical legend, Louis Jordan, ran little more than a year in New York. Comparing the Broadway cast album with the London recording, it’s apparent that something hard to define has been lost. The reduced instrumentation (only six onstage musicians) gives this performance more of a jazz-combo feel. Broadway professionalism is everywhere in evidence, but true spontaneity and joy are in shorter supply; the licks sound rehearsed, the group singing is muddy, the tempi are slower in places. Even the audience, faded in and out by the engineer, is less noisy. On the credit side, the Broadway CD booklet offers lyrics and more photos than the London insert, plus essays by David Hinckley, title-song author Larry Wynn, and Cameron Mackintosh himself. — M.S.